Interesting number, 10. 10 fingers, 10 toes, we count in 10s, we talk about top 10s, 10 things to do before you die and then, of course, there was Bo Derek. I got to thinking about it recently, looking at some folk who were competing in the Tour Divide Race and watching their ability to sustain a good overall average speed. Now 10 miles per hour doesn't seem very fast in that regard. Most reasonably fit cyclists will be able to average 10 mph. Sit on a bike, start pedalling and you'll soon be at 10 mph. But it's sustaining that over longer distances and durations. What becomes obvious is that trying to maintain an average of 10mph also means reducing stopped time. Every second the wheels aren't turning eats into your overall average speed and maintaining 10 mph suddenly isn't so easy. I recently had the opportunity of a free lift to John O'Groats so I planned to ride down to Inverness on National Cycle Network Route 1. I was keen to do this as we lots of customers going this way (though normally northbound) and the Cromarty-Nigg ferry service had just re-opened, making the Black Isle section of NCN 1 a good through route again. However, after a phone call from home relating to a family illness, the ferry option became untenable. The last evening ferry is at 18:00 and the first morning ferry isn't until 8:15. Frankly, I was never going to make the former and I didn't fancy hanging around all night. I therefore opted for plan B - I'd stick to the "standard" NCN1 route through Alness, Evanton and Dingwall and I'd see what was needed to do to get through a long days riding at that target of 10 mph. With a bit of route planning I was able to come up with a nice ready-reckoner for when I would have to be leaving a few points en route and this would be my quick look-up for the day. Mainly, these were places where I might find food. I was carrying a little with me but was also hoping to see what I could shop-forage as I went. As back-up, I also had my bivvy, sleeping bag, mat and tarp (all having been packed when the ferry option was still on). The weather forecast was for light westerlies and showers. I knew I had 60-odd miles of riding west to start with but this sounded perfectly fine. Standing at the famous John O'Groats signpost on the Sunday morning, I was very aware that the "light" winds were a bit stronger than ideal. It was knocking a few degrees off the temperature too as they seemed to have swung more towards the North West. On the upside, the skies didn't look too threatening. Not quite so pleasant the following morning. Undaunted - and with little option - I set off up the hill and onto NCN 1. It was 8:32. Looking down to Gills Bay I could see the morning ferry from Orkney just arriving. As a result, there was quite a bit of traffic on the main road. I was glad to be up on NCN 1 and away from all of that. 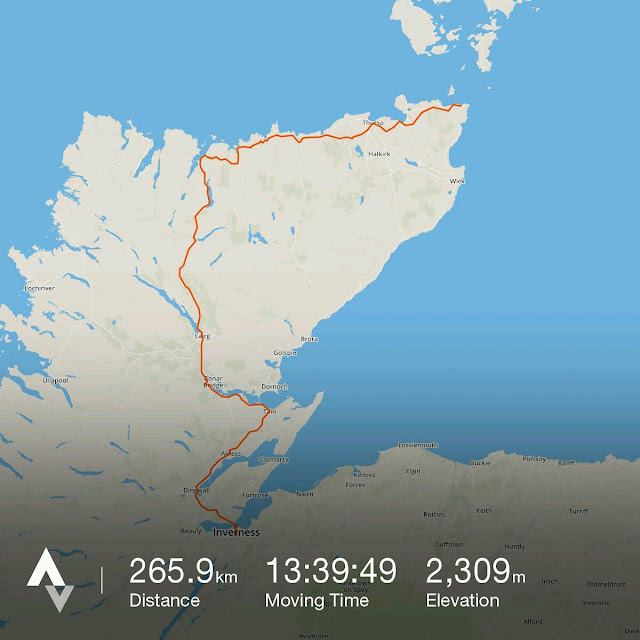 Initially, the headwind didn't seem too bad, but as I approached Thurso it was already beginning to get a bit annoying. My first "checkpoint" was Strathy. I arrived a whole 53 mins ahead of schedule, having averaged 12.6 mph. This was easy. Into Bettyhill and checkpoint 2. Due to hills and the headwind my speed had dropped a little to 11.4 mph and it was obvious my options for grabbing food were going to be very limited. Being Sunday, the only shop in the village was closed, a pattern that was repeated throughout the day. I did manage to find a hotel and bar offering lunch so opted to climb off the bike for a while. With an overall average speed in mind, it became a frustratingly slow experience. Find staff, explain requirement, wait to be seated, wait for menu, select food. wait for staff, order food, wait for food, eat, wait for staff, ask for bill, wait for staff, offer payment, wait for change. Every minute sat waiting becomes 1/6th of a mile not travelled. As a result my 45 minute stop had dropped my speed to 9.7 mph so I was now behind schedule. Just for good measure, the wind also seemed to be getting stronger, however it was blowing all the cloud and rain inland so at least I was staying dry. I was, though, glad to reach Coldbackie where the route turned south, even though that meant I was heading into darker skies. I'd been having to pedal downhill in places and I was looking forward to being able to freewheel a little more often. In fact, so happy was I about this prospect that I stopped for a celebratory coffee and cake. More delay, but I hoped that not fighting the wind would make a difference to my moving average. A short stop here meant that I went through Tongue 36 minutes behind schedule, an average of 9.6 mph, despite all the hard work along the coast road. Heading south definitely seemed easier and, despite the impact on my speed, I also stopped for a couple of photographs. The view over the Kyle of Tongue is superb, often matching that of some of the Hebridean beaches. Today, the overcast sky had knocked much of the colour out of it but Ben Loyal stood to the south looking like some mischievous god had plucked it out of Skye, dumped it in Sutherland and thought "this'll keep them guessing". Heading towards Altnaharra on the "main" road. As the road wound up and down past Altnaharra and lonely Crask Inn I felt I was going a little faster and passed through the latter now only 15 minutes behind schedule. Digging into my food bag I found a Eat Natural Protein bar and managed to rip the wrapper open with my teeth. What followed was 15 minutes of laborious chewing. It was dry as a budgies litter tray and barely more tasty. I reckon I actually consumed more calories eating it than it gave up. On the faster descents towards Loch Shin I was in the big ring and as I hit Lairg all attempts to shift out of it failed. I knew that staying in a 52-tooth sprocket was never going to work so stopped in Lairg to see what could be done. Despite fiddling around with cables and trying everything I could, the only option available was to reset the front mech so it was over the middle ring. Despite it being gala week, Lairg was pretty dead. I knew there was a hotel serving food but I was now very aware of how much time delay that would cause so I passed it by, leaving Lairg 14 minutes ahead of schedule, average speed now 10.2 mph. I now knew that the only option for hot food would be at Invershin so pressed on arriving 24 minutes ahead, 10.4 mph average. The menu had a limited range and I struggled to work out what I wanted and what wouldn't take too long, eventually opting for a burger. Though it arrived promptly enough, I found I really struggled to eat it. It felt more of a necessity than a desire and so it took me quite a while. I also had to call home at this point, further delaying my departure. As a result I was now 29 minutes behind schedule, overall average 9.6 mph. On the up side, the weather had taken a turn for the better and it looked like I might make it back to Inverness dry. Across the weird bit of cyclepath by the rail bridge and I was now on some very quiet roads, becoming familiar as I hit Ardgay. Coming on to the A9 at the Dornoch Bridge was a bit mind-jarring though. It's hard to believe Britains premier long distance cycle route is routed on the A9 trunk road with no path, markings or other form of segregation. Mind you, it's a wide enough road and at 10pm on a Sunday evening it's not like there was too much traffic. The turn off to Tain soon appears and what's then required is some careful sign-watching as this is where the optional route via Nigg and Cromarty peels off. Tain also marked a return of westward riding and hence of the headwinds I'd been sheltered from for several hours. I'd made up some time on the last leg and just hoped this wind wasn't going to be a problem as I was now only 7 minutes behind schedule, 9.9 mph, tantalisingly close to my 10 mph target. It was about now that the lights came into play. I'd had the dynamo running all day (attracting a few flashers) and now switched on my helmet mounted lamp too. This proved essential on the run into Evanton where the cycle path flits around from one side of the road to the other with lots of 90 degree corners and road crossings. Frankly, I found it all a bit frustrating, slowing me down unnecessarily, although I can see why it would be a great thing for kids cycling to/from school etc. The road rises away from the A9 for a while before quickly dropping into Dingwall. Again, a wee bit of careful observation for NCN signs is necessary but I was past the railway station 11 minutes ahead of schedule and now at 10.1 mph. I knew it was now just about the climb over the Black Isle. The westerlies were now crosswinds and there is a decent path/track all the way to Kessock. With that in mind I just kept a steady pace up to and past Tore roundabout (where some workmen were completely mystified by this late night cyclist) and to my penultimate checkpoint just before Kessock where I found I was 24 minutes ahead of schedule, 10.3 mph. I was now pretty sure I'd done enough and was feeling elated but the rain I'd mostly managed to avoid all day finally caught up with me crossing the Kessock Bridge and then I was suddenly into the various twists and turns of NCN 1 again. I was eager to get back to the van and dry but also dreading making a wrong turning and having to back-track at this late point. A final photo stop alongside the River Ness and I arrived at Bellfield Park at 00:39. 28 minutes ahead of schedule and with a final overall average speed of 10.2 mph. Target met then, with a little to spare, but quite a few lessons learnt or at least driven home. The most obvious conclusion is that stopping for any length of time really knocks back the average speed in a way I'd not really been consciously aware of before. A couple of minutes here and there will always add up. Minimising stop time makes for faster times or less effort for the same time. The second was that sitting down to eat a meal is often almost instinctive rather than logical. That burger at Invershin seemed like such a good idea before I had to eat it (and it was a lovely burger). Eating little and often, especially if undertaken while pedalling, doesn't place such a sudden big load on the stomach. Third was remembering not to panic if a leg or two is a bit slower than planned. If you're not taking hills and winds into consideration then expect the average to ebb and flow a bit. The fourth lesson only really hit home the following day. Although it's been years since I did a ride of this length, a steady easy pace saw me through it with no major pains and aches. I was comfortable during the whole ride and was still able to enjoy it all. There's something to be said about not underestimating your abilities. What if I'd set out to do the whole ride in one day, I'd have not had bivvy gear and overnight clothes with me, the load would have been lighter and less of an effort required. What if I hadn't suffered that headwind for the first few hours. I'd have been quite a bit quicker and my legs would have been a lot fresher later on. What if I was actually fitter and had a few long rides like this under my belt? What if the route was a bit longer - 200 miles, 240?